The weekend before last I enjoyed an ice cream in the sun in Berlin (without a coat on) so there is hope that spring is on it’s way to London too, even though it is a little too cold for my liking at the moment. But before it’s all barbecues and salads, let’s indulge in the comfort food of colder seasons, like this very creamy polenta with aubergine and chorizo in a rich tomato sauce. Yes, let’s! Fry the pressed garlic in some oil in a non-stick saucepan on medium heat for a minute. Add the tomato paste and chopped tomatoes and a splash of water. Let the sauce cook for 15-20 minutes until it’s thickened nicely. Stir occasionally. Season to taste with salt and pepper. Fry the aubergine cubes in oil until golden. Remove from pan and fry the chorizo slices. Add to the tomato sauce when it’s done. Bring the stock to the boil in a large saucepan. 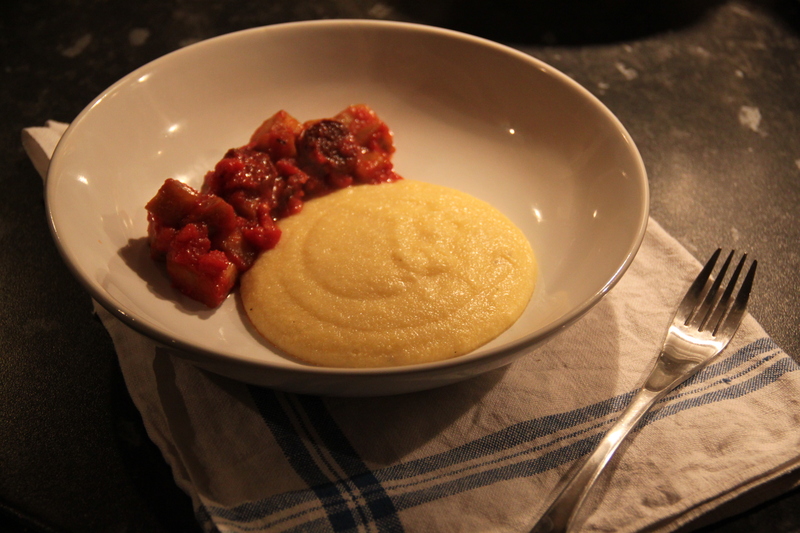 Add the polenta bit by bit, stir with a wooden spoon while it thickens (this happens pretty quickly). Remove from heat and add butter, parmesan, garlic, salt and pepper. Serve with the tomato sauce. It is not as often as I would like, that I have time to stand by the stove and look after a casserole (thank god for the oven and slow-cookers), but one Sunday I found the time and enjoyed a few hours in the kitchen. 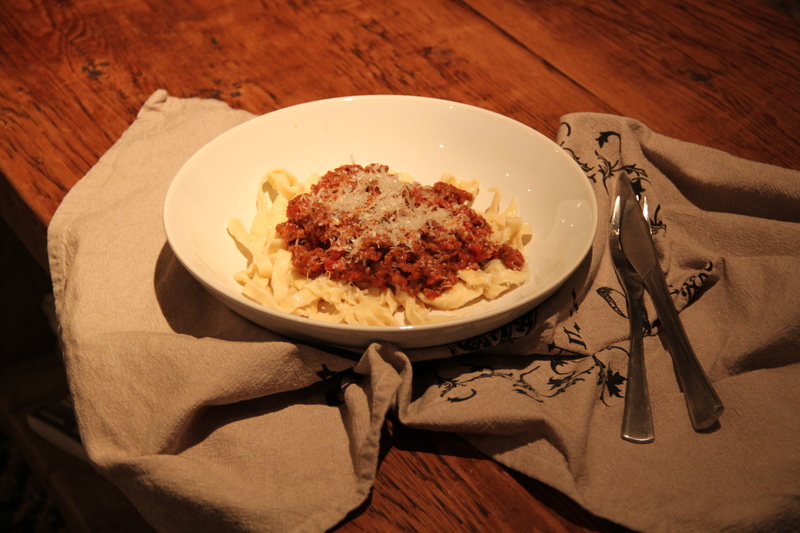 Although made with mince this bolognese was done properly; starting with a soffritto, adding the best tinned tomatoes and tomato purée and eventually red wine and cooking slowly on low heat. In the meantime I prepared some tagliatelle and baked marrow bones to add bone marrow to the casserole towards the end. The idea to have bone marrow in a bolognese sauce is entirely Massimo Bottura’s and I’ve been thinking about trying it since I heard him speak at Taste of London in June. I loved the addition of bone marrow but I love it in all types of dishes. This is still a subtle way of serving it, almost sneaking it in, but the depth and umami it adds make wonders for the stew. But, if you don’t like the sound of bone marrow just omit it, the bolognese sauce is still delicious! Mix equal parts onions, celery and carrot in a food processor. Use 3 tbsp about it and freeze (or keep in the fridge for other stews) the rest. Fry the mince in a knob of butter in a frying pan. Add a knob of butter to a casserole dish and fry the soffritto on medium heat for a few minutes. Add the chopped tomatoes and water, tomato purée and garlic. Leave to reduce a little. Add the fried mince and red wine and leave to simmer for about 1 hour. Season to taste and add the herbs if needed. Preheat the oven to 200C and place the marrow bone on a baking tray and roast in the office until cooked through (i.e. not red/pink in the middle but see-through and a little brown at the edges). Scoop out the marrow and add to the casserole. Season to taste one last time then serve (with tagliatelle and plenty of grated parmesan). I find it interesting how much our food preferences change with age. As a child I didn’t particularly like eggs, but if I had to eat it I preferred the whites, fried hard or a scrambled version of a fried egg with Swedish hash. Nowadays, I love eggs. Especially the yolk. I want it very runny, and if I make oeufs en cocotte I don’t mind if the white is runny too. 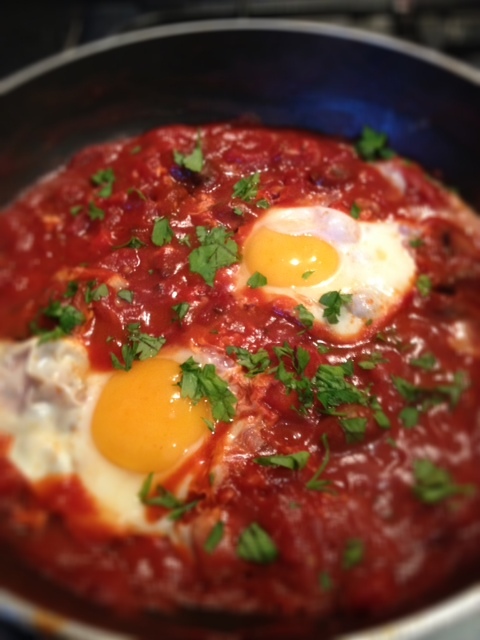 So it is easy to understand why I fell for this simple Italian dish of eggs kind of half poached, half fried in tomato sauce. I had this for supper with some nice bread to mop up the sauce and it was, in its simple way, utterly delicious. You can make a bolognese version of this, but with the creamy egg I need nothing more than some vegetables in my tomato sauce. Fry the mushrooms in oil on medium heat in frying pan. Season and remove from pan. Add more oil and fry the onions until soft. Add the tomatoes and fry for a few minutes. Add the tomato sauce and wine and bring to the boil. Let the mixture thicken if needed. Adjust seasoning and add the mushrooms. Make sure you keep the heat on medium and crack the eggs into the pan. Cook until the whites are set then remove from heat. Serve straight away with some nice bread. 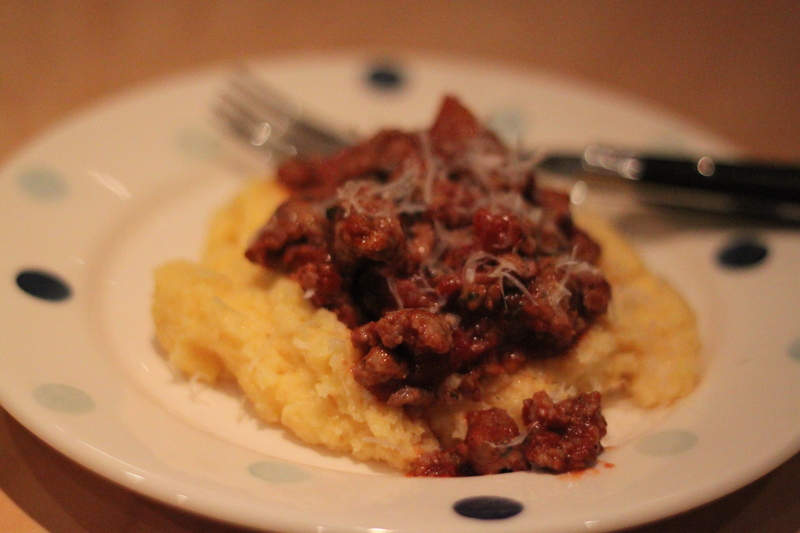 Polenta was non-existant in Sweden in the 80s when I grew up. We only had locally sourced food and anything ‘exotic’ was canned pineapple, bananas and peanuts. Several dishes from the 80s combine all three. No, polenta I discovered on my own and loved from the first bite. I like the texture and the fact that it tastes of nothing until you’ve added butter and parmesan, and it is such a wonderful transformation. I sometimes serve it simply with fried mushrooms or fried chorizo, but this time I wanted something even more soothing and comforting. The casserole is a cheat, but tastes lovely. 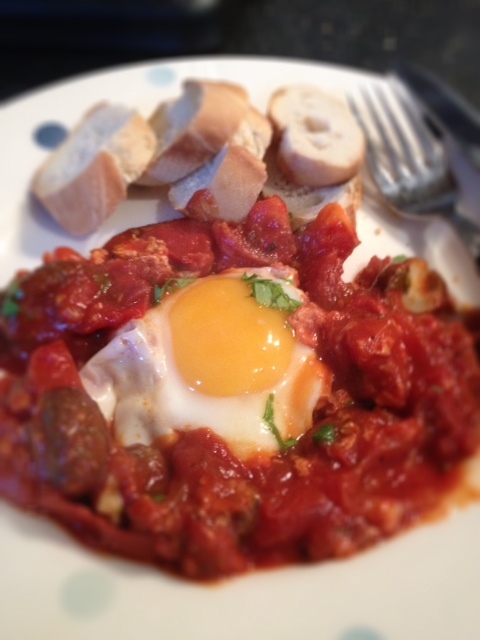 Using French Toulouse sausages makes it as unauthentic as serving it with Spanish chorizo, but both versions work – believe me. Just use good quality sausages as most of the flavour comes from them and season the sauce sauce to your own taste. Cut the skin of the sausages and push our the sausage meat. Fry it until cooked through in some oil. Add the tomatoes and water and bring to the boil and let thicken. Add balsamic vinegar, sugar and seasoning to your taste. Maybe also add some garlic. 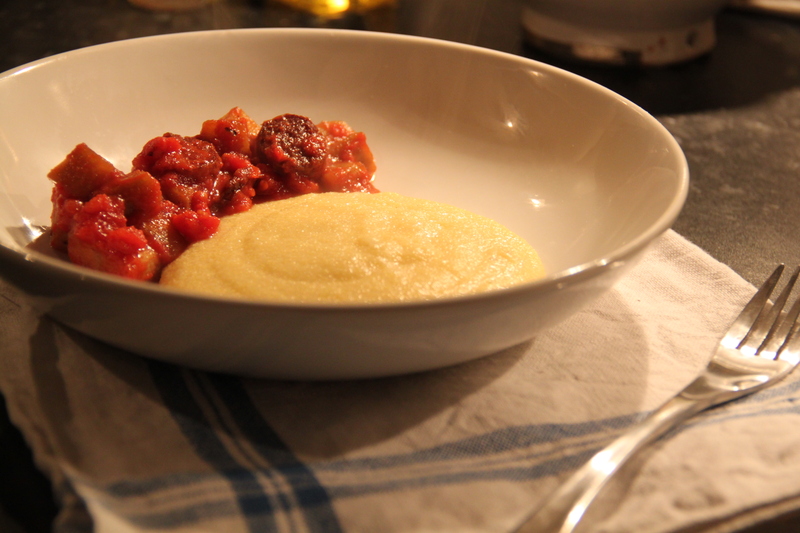 Plate the polenta and casserole, top with grated parmesan and enjoy. Not evry long ago I saw that Annika at the Swedish food blog Smaskens.nu had been making a boeuf bourguignon with beef mince and I thought that was a nice thing to try. But then I remembered I had a kilo of lovely venison mince (from fallow deer) in the freezer from Sweden and tried the recipe with that. As usual though, I made a few changes, but not all of them because I wanted to. For starters I had to use streaky bacon instead of lardons, because I couldn’t find any lardons in my local supermarket. Shame on you Sanisbury’s. I also cooked the dish in my slowcooker while I was at work, and that worked really well. 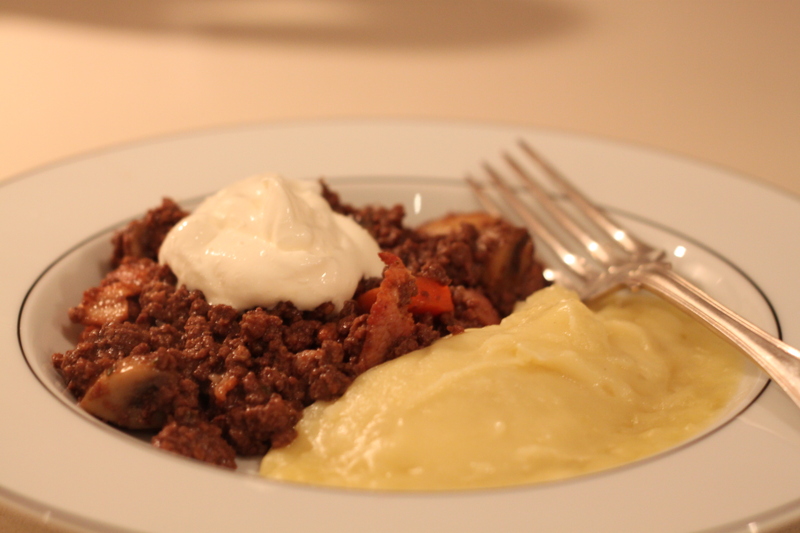 Because venison mince is very lean (like all game) it really works to either cook it with some more fatty ingredients, like cream or to serve it with something richer. I went for the latter, because you should not have cream in a bourguignon! Instead I made a very creamy potato purée with lots of butter to serve with it. 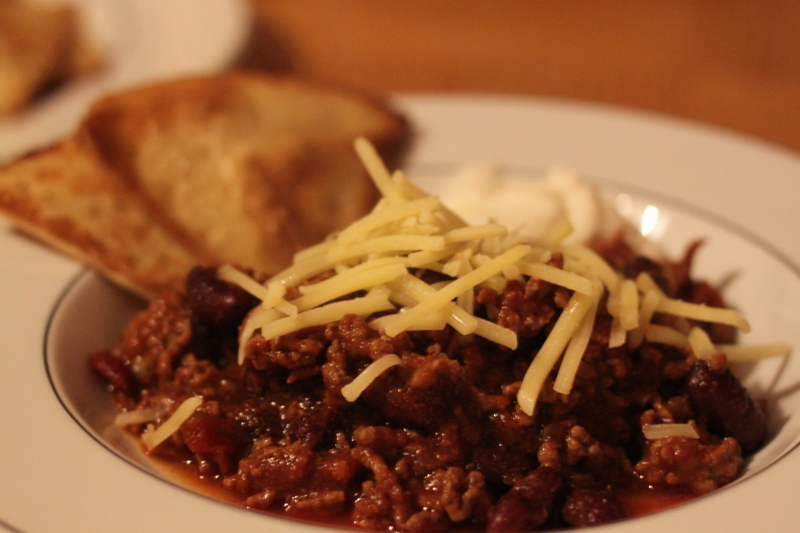 It was the perfect combination and also how Annika served hers with beef mince. Thank you for that suggestion! Below is my own version of this dish, but I found all the inspiration here. 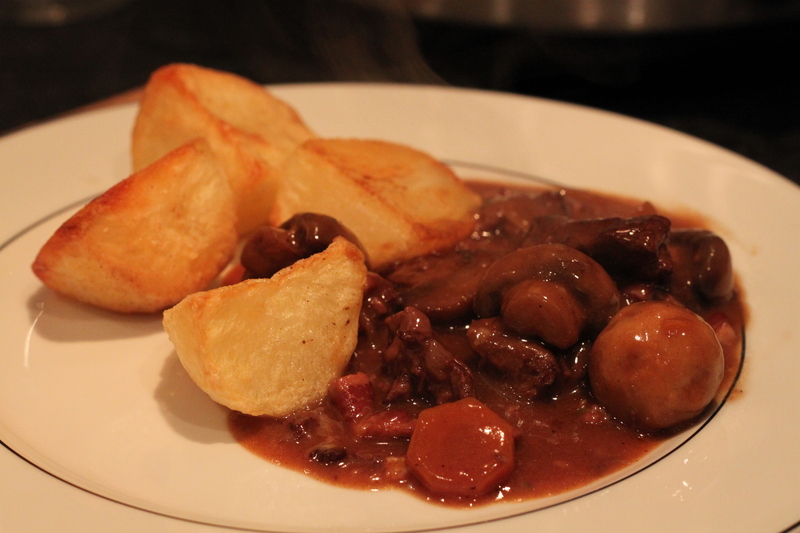 If you fancy a proper Boeuf Bourguignon instead, then try the ultimate recipe by Julia Child. Brown the mince in butter and transfer to the slowcooker. Add wine, stock, water, garlic, herbs, tomato purée, salt and pepper. Turn it on low heat and leave it for 8 hours. Transfer the pot to the stove (or pour the stew into another pan) and add the wine, carrots, tomato purée and maizena/corn starch. Bring to the boil and let it simmer for 10 minutes to thicken and for the carrots to cook. In the meantime, fry the mishrooms in butter on high heat, then the lardons/bacon and add to the pot. Season to taste with sugar, herbs and salt and pepper. Serve with a buttery potato purée (cook waxy potatoes until very soft, mix with a plenty of butter with a stick blender, season with salt and pepper) and creme fraiche. If you have leftovers the stew will only taste better the next day. Since I bought my crockpot a while back it has provided me with some nice stews and a lot of pulled pork. But would it work with the ultimate stew – the famous Julia Child Boeuf Bourguignon? It did! I mean, it doesn’t cook itself like many other stews, but once you’ve done all the prepping, you can definitely leave the rest to the slow cooker. I did all the chopping and frying in the morning, turned on the crockpot and went to a friend’s house for the afternoon. When I got back in the early evening, I fried some mushrooms and added them to the pot and got the potatoes roasting. Other than that supper was labour free. Cut the bacon into lardons. Simmer rind and bacon for 10 minutes in water. Drain and dry. Preheat oven to 230C. 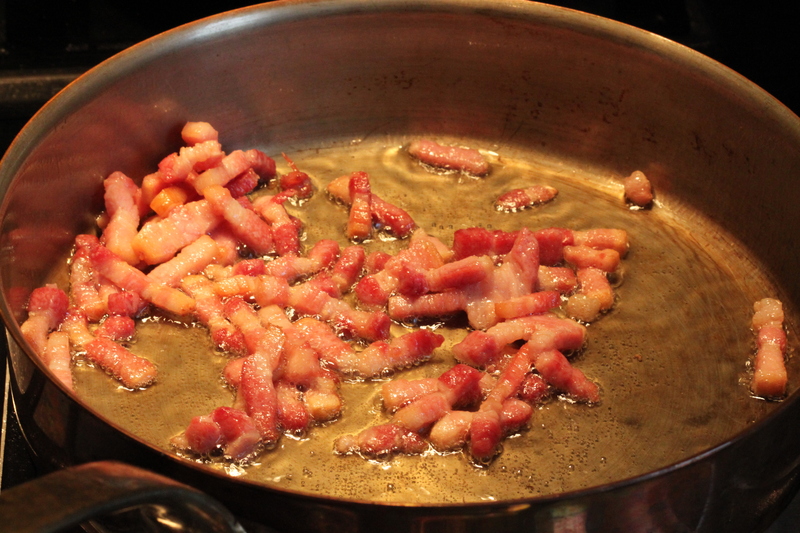 In a frying pan, sauté the bacon in oil over moderate heat for 2 to 3 minutes to brown lightly. Remove to a side dish with a slotted spoon. Leave frying pan aside. Reheat until fat is almost smoking before you sauté the beef. Dry the beef; it will not brown if it is damp. Sauté it, a few pieces at the time, in the hot oil and bacon fat until nicely brown on all sides. Add it to the bacon. In the same fat, brown the sliced carrot and onion. Place the bacon, meat, carrots and onions in the slow cooker pot and toss with salt and pepper. Then sprinkle on the flour and toss again to coat the beef lightly with the flour. Place casserole uncovered in the middle position of preheated oven for 4 minutes. Toss the meat and return to oven for 4 minutes more. (This browns the flour and covers the meat with a light crust.) Remove casserole and turn the oven off. Stir in the wine, and enough stock so that the meat is barely covered. Add the tomato paste, garlic and herbs. Turn the slow cooker on low heat and leave it for 5 hours. Before serving, fry the mushrooms. Place a frying pan over a high heat with some butter and oil. As soon as you see that the butter foam hasbegun to subside, indicating that it is hot enough, add the mushrooms (washed, well dried, left whole if small, sliced or quartered if large). Toss and shake the pan for 4 to 5 minutes. During this the mushrooms will first absorb the fat. In 2 to 3 minutes the fat will reappear on their surface, and the mushrooms will begin to brown. As soon as they have browned lightly, remove from the heat. If the sauce is too thick, remove the meat and add some stock. Check the seasoning. Put the meat back. Add the mushrooms and heat up. If the sauce is not thick enough, remove the meat and reduce the juices. Check seasoning, put the mat back, add the mushrooms and warm up to serve. The sauce should be thick enough to coat a spoon lightly. I adore comfort food, and I love when eating something makes you feel better. Sometimes you notice the physical effects straight away; your belly feels full, you get energy again and you stop feeling dizzy. But it almost always, at least if it is well cooked food, makes you happier. If I am down it helps to eat. Not for the sake of eating, but everything feels a bit better after you have eaten something warming and your belly is full. With the autumn, or nearly winter, hitting London, I feel I need something comforting for supper almost everyday. That warm embrace of hearty food is difficult to beat and for me a few things hits the bull’s eye. Creamy dishes and casseroles or soup. This is from the latter category and really does the trick. With a bit of a kick to it as well as the melted cheese on top and the bread to soak up the juices in the bowl this qualifies as one of the best autumnal comfort dishes out there, don’t you think?! Fry the meat in a large pan. Add salt and pepper. Remove the meat and pour out the meat juices. Fry the onions and garlic until soft but not browned in olive oil. Add the meat, chopped tomatoes and water. Bring to the boil. Add everything but the beans. Season and add more spices if needed. Let it boil until the sauce has thickened. Add the beans and cook for another few minutes to warm up the beans. Serve with grated cheese, sourcream and bread. And perhaps some salad.